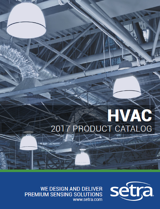 Low pressure measurements are required in various applications such as air flow, static duct and cleanroom pressures in HVAC and energy management systems (EMS). Other applications include use in medical instrumentation, environmental pollution control, boil combustion efficiency and a wide variety of research and development requirements. 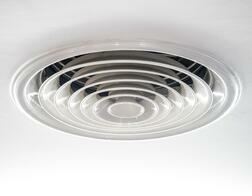 Although the focus will center mainly on air flow and pressure, the same principles apply to liquids. Low pressure ranges are typically from 0.1" H2O (0.004 PSI) FS up to 25" H2O (0.903 P SI) FS. The pressure transducers used to make these measurements are very sensitive and overpressure can adversely affect accuracy, or in extreme cases, damage the units. Below are four considerations to keep in mind when dealing with low pressure measurements. Low differential pressure measurements can be made with high line pressure, although be sure that the line pressure doesn't exceed the maximum pressure rating of the device. Pressure relief valves with adequate venting capacity should be used in any system in the supply is capable of delivering the air, gas or fluid at pressure greater than the capacity of the pressure sensor. For differential pressure measurements at high line pressure, it's recommended to install the pressure transducer with a valve in each line. 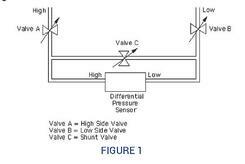 A shunt valve across the high and low (reference) pressure ports should also be installed (See Figure 1), which is especially helpful for liquid measurement applications. Valve C should be open and Valves A and B closed whenever the system is first being wetted or pressurized. Next, Valves A and B should be opened slowing the avoid fluid hammer. Valve C can then be closed, allowing the system to operate. When the differential pressure is removed, open Valve C first, then close Valve A and B. Many types of pressure transducers are sensitive to vibration and the mounting position. Contact the pressure transducer manufacturer if either are an issue, since both can alter the accuracy. Temperature variations in both the ambient conditions and the media (liquid or gas) can affect the accuracy of the pressure transducer's output signal. Check the operating temperature range and thermal error specification of the pressure sensor to determine compatibility for the application. Media compatibility with a pressure transducer must be insured to prevent failure or contamination of the media itself. Most manufacturers will list the materials of construction that will come in contact with the media, and provide recommendations on which to avoid. CLICK HERE to learn about 3 overlooked sensor design considerations.